For other people named Roy Haynes, see Roy Haynes (disambiguation). Live at Carnegie Hall, September 18, 2007. Roy Owen Haynes (born March 13, 1925) is an American jazz drummer and group leader. 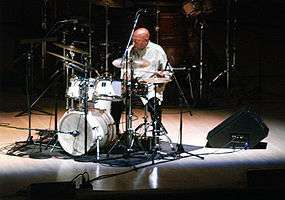 Haynes is among the most recorded drummers in jazz, and in a career lasting more than 70 years has played in a wide range of styles ranging from swing and bebop to jazz fusion and avant-garde jazz. He has a highly expressive, personal style ("Snap Crackle" was a nickname given him in the 1950s) and is known to foster a deep engagement in his bandmates. He has also led his own groups, some performing under the name Hip Ensemble. His most recent recordings as a leader are Fountain of Youth and Whereas, both of which have been nominated for a Grammy Award. He continues to perform worldwide and was inducted into the Modern Drummer Hall of Fame in 1999. His son Graham Haynes is a cornetist; his son Craig Haynes and grandson Marcus Gilmore are both drummers. Born in the Roxbury section of Boston, Massachusetts, Haynes made his professional debut in 1944 at the age of seventeen in his native Boston. Haynes began his full-time professional career in 1945. From 1947 to 1949 he worked with saxophonist Lester Young, and from 1949 to 1952 was a member of saxophonist Charlie Parker's quintet. He also recorded at the time with pianist Bud Powell and saxophonists Wardell Gray and Stan Getz. From 1953 to 1958 he toured with singer Sarah Vaughan and also recorded with her. Haynes's influence on the rock world has also been apparent, with a tribute song recorded by Jim Keltner and Charlie Watts of the Rolling Stones, and recent on-stage appearances with the Allman Brothers Band and Page McConnell of Phish. In 2008 Haynes appeared in Grand Theft Auto IV as himself radio station JNR. A 3 CD/1 DVD boxed set entitled A Life in Time - The Roy Haynes Story was released by Dreyfus Jazz in October 2007. The set chronicles highlights from Haynes career from 1949 to 2006, including recordings with Parker, Vaughan, Davis, Monk, Corea, Metheny and his own Hip Ensemble and Fountain of Youth quartet. The set was listed by The New Yorker Magazine as one of the Best Boxed Sets of 2007, and was nominated for an award by the Jazz Journalist's Association. WKCR-FM, New York, surveyed Haynes's career in 301 hours of programming, January 11–23, 2009. On April 21, 2016, at the age of 91, Haynes performed drums on The Late Show with Stephen Colbert, accompanied by Jon Batiste and Stay Human (band). Haynes extracted the rhythmic qualities from melodies and created unique new drum and cymbal patterns in an idiosyncratic, now instantly recognizable style. Rather than using cymbals strictly for effect, Haynes brought them to the forefront of his unique rhythmic approach. He also established a distinctively crisp and rapid-fire sound on the snare; this was the inspiration for his nickname, ‘Snap Crackle’. Haynes endorses Yamaha drums, pedals and hardware, Zildjian cymbals and Remo drumheads. He also uses his Zildjian Roy Haynes signature drumstick and has a Yamaha Roy Haynes signature snare drum. In the past, he endorsed Ludwig and Slingerland and he has been photographed playing Latin Percussion, notably congas. Haynes had used Paiste flat rides in the past, thus indicating he may have endorsed Paiste at some stage. Esquire named Roy Haynes one of the Best Dressed Men in America in 1960, along with Fred Astaire, Clark Gable and Cary Grant. He was inducted into the Down Beat Magazine Hall of Fame in 2004. 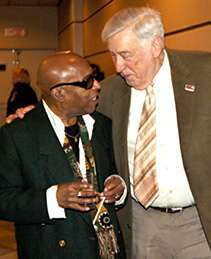 On October 9, 2010, Roy Haynes was awarded the Mid-Atlantic Arts Foundation's BNY Mellon Jazz Living Legacy Award at the Kennedy Center for the Performing Arts in Washington, DC. On December 22, 2010, Haynes was named a recipient of a Grammy Lifetime Achievement Award by the National Academy of Recording Arts and Sciences. Haynes received the award at the Special Merit Awards Ceremony & Nominees Reception of the 53rd Annual Grammy Awards on February 12, 2011. ↑ Fountain of Youth Archived November 12, 2007, at the Wayback Machine. ↑ Archived November 13, 2007, at the Wayback Machine. ↑ "Charlie Watts". Rosebudus.com. Retrieved 2011-10-18. ↑ Dreyfus Jazz Archived January 12, 2008, at the Wayback Machine. ↑ "WKCR 89.9FM NY". Wkcr.org. Retrieved 2011-10-18. ↑ "Timeoutnj.com". .timeoutny.com. Retrieved 2011-10-18. ↑ "The Recording Academy Announces Special Merit Award Honorees". Grammy.com News. Retrieved December 22, 2010.